This site is intended for providing general information and should not be used as a substitute for any form of advice or otherwise be relied upon. Capstocks & Securities (India) Pvt. Ltd. does not warrant the accuracy, adequacy or completeness of this information and material and expressly disclaims liability for errors or omissions in this information and material. No warranty of any kind, implied, express or statutory, including but not limited to the warranties of non-infringement of third party rights, title, merchantability, fitness for a particular purpose and freedom from computer virus, is given in conjunction with the information and materials. 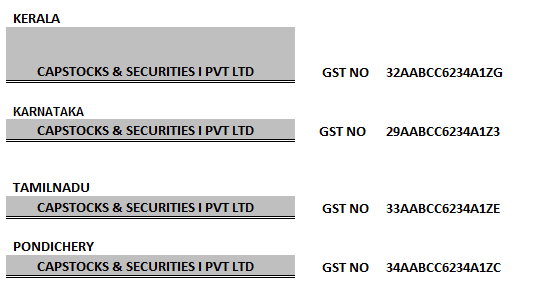 In no event will Capstocks & Securities (India) Pvt. Ltd. be liable for any damages, including without limitation direct or indirect, special, incidental, or consequential damages, losses or expenses arising in connection with this website or use thereof or inability to use by any party, or in connection with any failure of performance, error, omission, interruption, defect, delay in operation or transmission, computer virus or line or system failure, even if Capstocks & Securities (India) Pvt. Ltd., or representatives thereof, are advised of the possibility of such damages, losses or expenses. Hyperlinks from and to other websites are at your own risk; the content, accuracy, opinions expressed, and other links provided by these resources are not investigated, verified, monitored, or endorsed by Capstocks & Securities (India) Pvt. Ltd. The Stock Exchange, Mumbai is not in any manner answerable, responsible or liable to any person or persons for any acts of omission or commission, errors, mistakes and/or violation, actual or perceived, by us or our partners, agents, associates etc, of any of the Rules, Regulations, Bye-laws of Stock Exchange, Mumbai, SEBI Act or any other laws in force from time to time. The Stock Exchange, Mumbai is not answerable, responsible or liable for any information on this Website or for any services rendered by our employees, our servants and us.